Love Food, Drinks, People and Customer Service? Join us at Fine Art Bartending and in two weeks we can put you through our comprehensive bartending course. Vancouver definitely has the appetite for great service and the restaurant and bar industry is just waiting for you! Most prospective bartenders like to set their sights high right out the gate. They want to be that all star, flashy restaurant bartender immediately! Unfortunately, sometimes that just isn’t reality. Don’t fret! Working as a food runner, bussing or serving at a restaurant first is probably the BEST thing you can do for yourself. Learning the foundations of working as a TEAM is essential to succeeding in any hospitality environment. If you know how to deliver food, take orders, plus work with the kitchen and management simultaneously, then it will make you a better bartender in the long run. If your kitchen isn’t working with your expediters, who in turn aren’t working with the servers, who then don’t work with the bartenders, the system breaks down quickly and guests will see this. Perception of a smoothly running operation reflects well on the entire restaurant and makes for a more pleasant working environment. A happy and communicative team is well rewarded. To become a great restaurant bartender you must learn the menu backwards and forwards, be sensitive to allergies and children if need be. Knowing the drink menu is imperative, the guest has a list in front of them, you better be able to speak to it with passion. Every drink requires the same amount of love and effort, so learn those recipes! 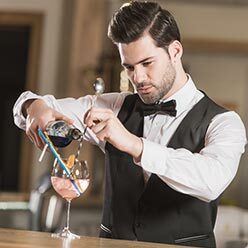 Being able to stand at the Bar crafting drinks, while serving your guests at the Bar “The Wood,” whilst running food makes for an excellent Bartender. Knowing how to deliver food and serve properly is a big skill to have, just because you are behind the bar doesn’t mean you don’t have to serve as well… Bartenders are food runners, bussers and servers in the Restaurant world. You are a jack of all trades! Every one of these roles will be asked of you. If you are uncomfortable in any aspect of these traits, then learn them and excel. ADD ON’s are a big thing in restaurants. “Do you want a soup or salad instead of fries?” or “Would you like to make it a double?” Upselling customers on a few extras not only improves the guests enjoyment, it raises the bottom line. Your floor manager will always be happy with more sales for the house and your tips will reflect this too. ‘Adding on’ means to add something to the original order to help boost sales. Suggest to a customer they might be interested in an appetizer when someone orders a main dish. Add a piece of cake after dinner and a specialty coffee drink to wash it all down. Servers aren’t the only ones with this task, Bartenders have customers sitting at the bar. Interest your bar patrons in a double highball, or bump them up to a premium brand of liquor. Shots anyone? Do what you can to increase revenue, your boss and your wallet will thank you. Being a restaurant bartender can be very demanding. To be excellent takes a lot of work and effort, however it is a very rewarding experience. Start off the right way and get trained in all aspects of the craft of bartending. Every great bartender started with proper instruction. At Fine Art Bartending we can point you in the right direction to land that Restaurant or Bar job. You’ll never go home starving! And if being a Fine Dining Restaurant Bartender just doesn’t have the pumping music you might need to thrive, you could always transition to the nightclub.